If you have or know a child in elementary school, chances are you have heard of Stampy Cat or his tell-tale “Hellllooooooooo!! This is STAMPY!” intro used in almost all of his videos. It’s a fun voiceover to colorful and very popular videos on YouTube and I am giving away a copy of the first and only official Stampy book , Stampy’s Lovely Book just released today! Voiced by Joseph Garrett, Stampy Cat is a YouTube sensation averaging over 47 million views a month. In fact, the Stampylonghead YouTube channel was in the top 10 most viewed channels worldwide in 2014. Stampy Cat has been making videos since 2006 and is well known for his Minecraft content. And let me tell you, kids LOVE him. Our family was a little bit late to the Stampy scene because we don’t really play Minecraft….yet. We have a Wii U and until the past couple weeks, the game hasn’t been available on our platform. However, all bets were off last fall when Oscar spent a weekend with his cousins learning as much about Minecraft as his brain could handle in 48 hours. With the rise of YouTube for kids, I am more comfortable with him watching kid-safe videos on my iPad. In fact, I’m told that Stampy Cat is consistently praised for his incredible reach and impact online, with Entertainment Weekly calling him “The Mister Rogers of ‘Minecraft’”. Stampy Cat essentially has his own world in Minecraft and it’s super fun to watch. So it should come as no surprise that when I was given the opportunity to check out the new book from Stampy, I said yes immediately (or “straight away” as Oscar now says. You see, Stampy is a British cat). Because YouTube videos are fun, but if that can translate into reading a book? I’m sold. Stampy’s Lovely Book is a fun adventure through Stampy’s world with games, activities, tips, jokes and exclusive info about Stampy and his friends. Oscar spent hours over Christmas drawing Stampy and his friends using pictures in the book and he told me his favorite thing so far is the spot the difference activities! 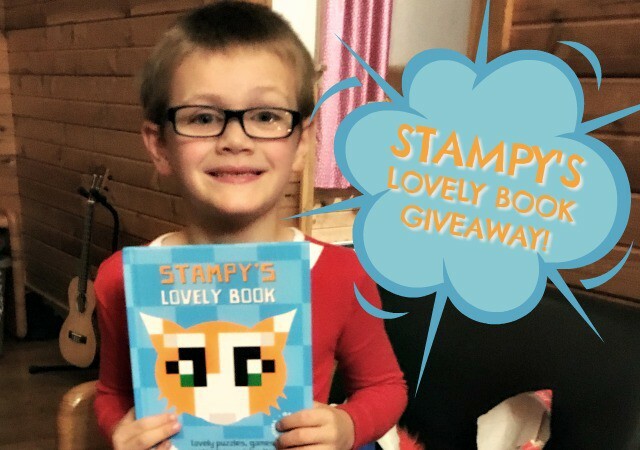 Enter for a chance to win Stampy’s Lovely Book! Stampy’s Lovely Book is inexpensive at the current price of $6.70. It just released today (January 5, 2016) so be among the first to check it out! That said, I have a copy to give away to one lucky reader! To enter, leave a comment on this post letting me know you are interested. For fun, feel free to share your own Stampy story! Thanks so much for reading, good luck and may you have cake! Lots and lots of CAKE! To check out all things Stampy Cat visit YouTube.com/StampyLongHead and follow him on Twitter and Facebook. Affiliate links appear in this post. Review and giveaway copy are courtesy of Penguin Randomhouse Publishing,. All opinions are my own. Grab your copy of Stampy’s Lovely Book on Amazon! One winner will be randomly chosen from the comments and notified by email. Entries accepted through 11:59PM ET, January 12, 2015. Stampy’s voice is in my dreams. 😉 But she wears headphones now, so it’s less often that happens. My daughter would love this so thanks for the chance to win! We love Stampy, even more now that he does Disney Infinity videos too! We have Pete the Cat knowledge from kindergarten. Stampy sounds like he would be Pete’s friend! Stampy is the only reason I know what Minecraft is! I love having videos I know my kid can watch without me worrying about the content. My grandson is addicted to Minecraft and would love this book. We had not heard of Stampy until a couple months ago. We moved and our neighbor boy is a big fan. So now we hear of him a lot. My kids do LOVE Minecraft.